With the world watching, CHC played a critical role in a dramatic cruise ship rescue operation amid treacherous conditions off the coast of Norway. 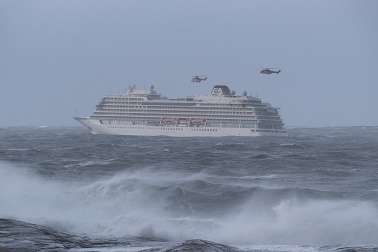 Over the weekend, Viking Sky, a cruise liner off the coast of Norway, issued a mayday distress signal after losing power during a brutal storm, stranding 1,373 people aboard the embattled ship. The Norway team quickly deployed search-and-rescue teams who safely airlifted 470 people, including 17 wounded, even as the ship was tossed amid 25-foot waves and was in danger of drifting into the rocky shoreline. Six crews from CHC’s Florø, Heidrun, Statfjord and Sola bases safely and expertly executed the rescue operation, which lasted more than 18 hours. The effort was manned by a total of twelve pilots, six hoist operators, seven rescue swimmers, one system operator, and two ground support engineers, with support from the Operations Center in Stavanger. The crews flew four CHC aircraft – two all-weather search and rescue configured Sikorsky S-92s and two Airbus AS332s – to support the rescue efforts. In addition a Sikorsky S-92 was used to transport extra crew members, volunteering to participate on their free time, to a nearby airport. Another Sikorsky S-92 at Brønnøysund was standing by on medevac readiness to compensate for the Heidrun AWSAR helicopter leaving its post. At 2:00 pm local time on Saturday, March 23, our team in Norway received a call for assistance from the National Rescue Service (HRS) to support the Viking Sky cruise ship rescue effort. The cruise ship was traveling south from Tromsø to Stavanger when it began experiencing engine problems amidst a storm with winds gusting at 45 kts, creating waves up as high as 15m. The engine trouble occurred in a stretch of sea known for rough, frigid water dotted with reefs and small islands that posed a major threat to the safety of the passengers on board. Fearing the ship would run aground, the crew managed to anchor in Hustadvika Bay, between the Norwegian cities of Alesund and Trondheim, in order for the evacuations to begin to take place. Within 30 minutes of the call for assistance, our first aircraft, CHC AS332L1 on contract with the Norwegian Ministry of Justice, arrived on the scene and began hoisting injured passengers, initially one at a time, off the cruise ship. A second CHC helicopter, AS332L on offshore SAR contract with Equinor at Heidrun, soon arrived on scene and assisted in the evacuation. The two helicopters worked seamlessly together in a rescue pattern that ensured one aircraft was hoisting passengers at all times. During each mission, 15 to 20 passengers were hoisted and subsequently transported to safety. Seeing that this was likely to be become an extended operation, the team at our Operations Center began to prepare for two more fully-crewed SAR aircraft to be flown to the Kristiansund base to support the evacuations. As the cruise ship rescue operation continued a second incident occurred nearby at sea during early evening. Cargo ship “Hagland Captain” experienced an engine seizure in the same stormy waters and nine crewmembers needed to be evacuated. The Florø rescue helicopter was retasked, along with a Norwegian Ministry of Justice SeaKing aircraft, to provide rescue support to the distressed ship. After restarting three of its four engines early Sunday, the Viking Sky, accompanied by two tug boats, navigated safely into the nearby porte of Molde, where the remaining passengers and crew disembarked. This dramatic rescue operation required extensive cooperation of our customers – Equinor and the Norwegian Ministry of Justice – the international military for the safe movement of our aircraft, as well as our Global Integrated Operations Center.